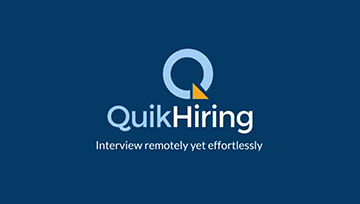 QuikHiring's Video Intro & Video Interviewing features bring Candidates and Recruiters as closer as in Real-Time. 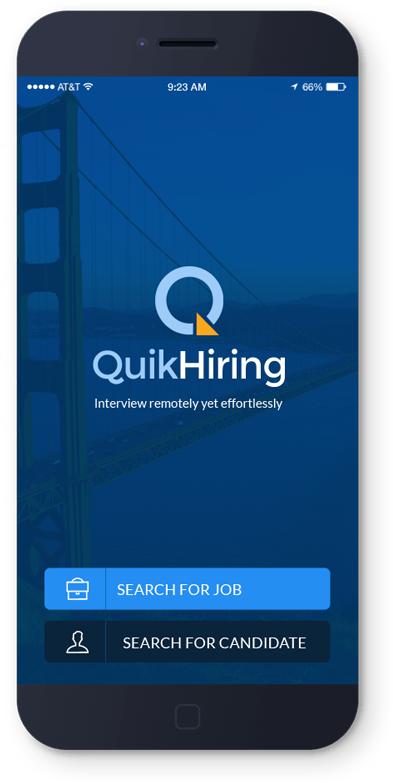 Download Quikhiring mobile job app for effortless interviews with better jobs & candidates. QUIKHIRING – An Effortless Video Interviewing Platform, WHY? One Single job app for job seekers & recruiters for map/location based searches, job postings, video profile & video interviewing capability. Job seekers can create video profile i.e. video intro in some simple steps. First, job seekers needs to do their registration with a unique email address & mobile number. After successful registration user will receive a confirmation mail on his/her registered email address. After email confirmation user can login and can create video profile using their mobile phone’s video camera. They can also login using their Facebook or Google+ account. After logging in for the first time, the Candidate needs to complete the profile in 3 easy steps. In first step, user needs to enter basic details. In Second step, users can upload their resume with some more basic details (Uploading a text resume is not mandatory). In third step, users need to upload their profile picture (preferable yet optional). Job finders can search for the Jobs from ‘Search Job’ screen. They can filter these jobs by entering details like location, salary range, skills & functional area. Candidate can view job listings or a map view to check job location and distance. For further knowledge they can check details of the job by tapping on any job’s marker. Further options of refining search results with various parameters like location, skills, role & functional area is available under the advanced search option. Candidates must create and save their Video Intro before applying for jobs. Recruiters would decide about your shortlisting based on your Video Intro. It will act like your partial interview. Applying for a job is an easy process. Candidates need to go to ‘Search Job’ screen and there they will get results for matching jobs. Check Job detail by tapping on any result. Candidate can click on’ Apply Job’ button to apply. For applying a job user must have uploaded a Video Intro which is though not required if you are invited by Recruiter. Recruiter will check all job applications received for any job and will shortlist the users after reviewing their profile and video intros. All shortlisted users will get notifications to initiate their offline video interview using their mobile phone. Candidate will follow the video interview tutorial, and answer the questions set by recruiter in given time frame. Once completed a video of the given interview will be created and sent to the Recruiter. User can give video interview only once per job. Recruiter would review the interview video and decide about the selection. Recruiters or Employers can create their company profile by following simple registration steps. They need to go to register screen or can directly login using their profiles in social networking sites (Facebook or Google +). After logging in Recruiters need to complete their profile by entering company detail and upload their company logo. Posting jobs is very easy. Recruiters can either use pre-defined templates or can create their own set of questions along with the time allowed to answer each question and can save as interview template to use them for any job posting. While posting a job, Recruiter simply needs to select Job Role, Functional Area, Location, and Salary & Experience Range and give a Job title, Description, and select Interview Templates. Whenever Recruiter shortlists any candidate from applied candidates, shortlisted Candidates will start their offline Video Interview on these previously set of questions. Recruiter can search appropriate candidate from ‘Search Candidate’ Screen. Recruiter will get the results based on search criteria. Recruiter can switch to map view too to see Candidate’s Locations and Distance. Recruiter can view profiles or watch Video Intro of candidates and can invite them to apply for any Job Posting. Recruiter can select any number of candidates and click on ‘Send Invite’ button to send them an invitation for a job interview for any of the Job vacancies. After invitation, candidate will get the notification on app as well as in email. They can open the job and start recording an interview based on the questions. Recruiter can view all the job applications, details of all Candidates who have applied along with their Video Intro and Video Interview if completed by Selected/Invited candidates. Recruiter can share these Video Interviews to anyone with an email to take their opinion. Invited Person will get an email with a link and can watch Interview Video and Candidate’s Profile Summary to give his/her rating on 1-5 scale. Once the rating is submitted, Recruiter can see the overall rating for that candidate and take hiring decision accordingly. Recruiters here will get the right candidate without investing lot of time by using mobile apps to conduct all interview rounds remotely and decide to call eligible candidates only to meet them finally. Recruiters can set the interview template with questions based on functional area and job roles. After setting they can invite the registered or non-registered candidates for a video interivew by entering email address. What Makes QuikHiring Different & Advanced? Simple To Use	We have 1-step registration on mobile app, menu driven quick shortcuts for creating profiles, posting jobs and for video interviews etc makes it easy to use. Video Intro & Interview	Bye Bye to lengthy text CV's. An easy to use video tool let's you create your video profile intro. Recruiter can watch video intro quickly and invite for video interview. Interview Remotely & Meet Selectively	Meet candidates remotely watching their video interview based on pre-set questions, share with colleagues to rate and select the relevant candidates only to meet you in person.  Hire someone or get hired, QuikHiring keeps everyone HAPPY!